US-led war games may look like a defensive manoeuver to us, but from North Korea‘s perspective they do not look the same. 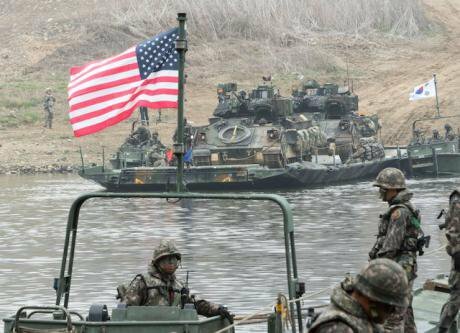 Joint US/South Korea field training exercises near the military demarcation line with North Korea in Yeoncheon, Gyeonggi Province, northern South Korea on April 8, 2016. Young Ho/Press Association. All rights reserved. “ I have to let them know I have missiles because this is the only way the US will talk to me”. The director of the CIA Mike Pompeo did not explicitly call for regime change in Pyongyang recently: he said he believes the North Korean people “would love to see” Kim removed from power, and that he remained hopeful the US would figure out a way. Shortly afterwards and probably in response to his colleague’s words, Secretary of State Rex Tillerson tried to reassure the country that the US did not seek regime change and wanted a productive dialogue. But should this be read as an attempt to soften the harsh tones of his boss President Trump who called “for fire and fury against the regime”? Does this administration have a coherent strategy or multiple conflicting voices? Western engagement with the DPRK has caused maximum frustration both because of the secrecy of the regime, the erratic and unpredictable nature of the leadership, and because they are not considered to have adhered to previous agreements. But the DPRK leadership are the ultimate political survivors. Tough rationalists, their actions have always had one clear purpose, no regime change. They have survived the collapse of the Soviet Union, a devastating famine, and the tragic failure of its own economic system. Today the young leader Kim Jong Un has the same long-term aim as his father and grandfather, to ensure the survival of the regime and that he remains in power. They are convinced that no foreign power would risk attacking them if they are a nuclear weapon state. They believe that without nuclear weapons, a direct attack from the US is highly probable and there is a real threat of internal interference by external governments trying to stimulate regime change. Until recently, North Korea has tended to be an afterthought in Washington’s geostrategic thinking. It is now high up on the political agenda. Recently the DPRK did not hesitate to demonstrate its burgeoning weapons arsenal when it fired off its new sophisticated long range ballistic Hwasong-14 missiles. By the end of Trump’s first presidency, these missiles could be capable of hitting Los Angeles and Washington with thermonuclear warheads. The North Korean leadership believes that telling the world that it is a continued threat is how you get to the negotiating table. Hermetically sealed from the outside world, it may well overestimate its political power. Political realism would suggest there is not going to be an immediate roll back of North Korea’s program now. Recent history in Iraq and Libya leads to the conclusion that if you give up your weapons the regime will not survive. The fate of Libyan leader Gaddafi has taught the Kim family a very clear lesson. In 2003, the Libyan strongman agreed to give up his nuclear weapons program in exchange for generous economic benefits by the west. But the story ended with Gaddafi’s violated dead body flung across the bonnet of a car. The fate of Libyan leader Gaddafi has taught the Kim family a very clear lesson. I visited North Korea last year and my experience confirmed its sense of isolation. Hermetically sealed from the outside world – it is a country that defines itself by its enemies. My aim was to understand better how this country thought. Of course my experience was restricted, as I was constantly accompanied by two young women minders who were loyal and obedient advocates for the regime. The old addage seemed entirely relevant, “ if you were born were I was born, you would think what I do think”. Those I spoke to did see the outside world as a threat and constantly referred to the past – to the Korean War, to the Japanese occupation of the peninsula, to the withdrawal of Soviet aid and American imperialism. Cut off from the outside world except on the borders with China, I could not use my phone or computer. They have no internet or social media. They have what they call “intranet`”. Tightly controlled by the government, it shapes and controls how they think and what information is available. Living standards seemed to be rising rather fast, particularly in Pyongyang, where state money is fuelling a construction boom, so that shops and restaurants are to be seen filled with the new elites. But in the rest of the country, life expectancy and calorific intake is not so generous and I wondered about the starvation conditions in orphanages as I tucked into my high protein diet of eggs, chicken, fish and vegetables often surplus for my requirement. Material conditions may have improved in North Korea, but psychologically they are still victims of their own history. Whilst North Korea may act provocatively in the eyes of the international community, it is also a traumatised country, expressing its fears and insecurities in threatening and perverse behaviour. It will in fact require great skills and subtlety in diplomacy to strike the right balance between the use of power, pressure and understanding the mind of the enemy, to lure the DPRK to the negotiating table. The DPRK rose out of the ashes of the Korean War where it morphed into a form of warrior communism. The seeds of its nuclear weapons programme reside in the experience of the country in the Korean War. During the war, Washington did not come close to the tactical use of the atomic bomb, but the American government repeatedly attempted to use the threat of nuclear weapons as a tool to manage the politics and diplomacy of the war. The North Korean leadership could hardly have failed to learn that trick of nuclear brinkmanship, with all its ensuing dangers. The Korean War (1950-3) alone killed 20 percent of North Korea’s population. When the bombs stopped in 1953, the US never declared a full armistice or signed a non-aggression treaty. From a North Korean perception, Americans still insist on retaining the “right” to attack their country. The 1953 Korean Armistice Agreement could have been more than a non-aggression pact. A peace treaty through serious negotiations, could have been more ambitious in its intention to explore whether there is scope for turning North Korea from a “rogue” state into longterm potential participant in the international community. Last week the United Nations Security Council agreed fresh sanctions against North Korea. A resolution was passed banning North Korean exports and limiting investments in the country. The export of coal, ore and other raw materials to China is one of North Korea's few sources of cash. And it is estimated to be worth $3bn worth of goods each year. Earlier this year, China suspended imports of coal to increase pressure on Pyongyang. In spite of this, President Trump tweeted last week that he was very disappointed with the Chinese and that, “our foolish past leaders have allowed them to make hundreds of billions of dollars a year in trade, yet … they do NOTHING for us with North Korea, just talk.” Provoking the Chinese will not be an effective way to proceed, since any identifiable successful outcome will only be achieved with the support of China. For their part, the Chinese are concerned that if North Korea collapses, it would leave China’s 1400-kilometre-long Yalu River border with North Korea exposed. It fears the potential chaos of state collapse and the crossing into China of up to 5 million refugees. From the Chinese perspective, as well, the North Korean regime acting as a buffer zone is preferable to a potentially reunified Korean peninsula with the threat of US troops on their border. As unpalatable as this may be, the harsh reality is that North Korea is a nuclear weapon state. There are no military options available. In this densely populated region, 25 million people live in the greater region of Seoul alone and North Korea has artillery weapons within range of Seoul. Based on the evidence, they have a significant chemical warfare capability. The situation is extremely dangerous and any new approach needs to be sought, which is not about dictating the agenda based on what we want the outcome to be. This seldom works. We need to start where the parties are and not where we want them to be. As unpalatable as this may be, the harsh reality is that North Korea is a nuclear weapon state. We need an approach that is not idealistic about what we want, but pragmatic about what is possible. First steps could include the scaling back of US and South Korea military exercises in exchange for the North agreeing to freeze its nuclear programme, tied to confidence-building measures. The regime has no intention of negotiating away its nuclear arsenal because it sees this as a survival insurance policy. This may happen once the North Koreans' perception of the outside world has altered, but paradoxically this will only happen with increased contact. And the US has just banned its citizens travelling to the country. In January, DPRK made an offer to “sit with the US anytime” to discuss US war games and its own nuclear weapons and ballistic missile programmes. Hardly reported in the western media, Pyongyang proposed that tensions could be eased in the first instance if the US temporarily suspended joint military exercises in South Korea and its vicinity and said that the DPRK is ready to take such responsive steps as temporarily suspending the nuclear test. Of course there are risks in seeing them as credible negotiating partners. But there are few good options. This” freeze–freeze “proposal has now been reinforced by China and Russia and more recently by South Korea’s new president Moon Jae-in. But Washington rejects the proposal, not wishing to acknowledge any equivalency between US-led war games and North Korea’s missile and nuclear tests. Washington rejects the proposal, not wishing to acknowledge any equivalency between US-led war games and North Korea’s missile and nuclear tests. A key part of the preparations will require quiet off-the-record diplomacy which addresses the insecurities of all parties, not just the ones with more power. Creating the conditions to get to the negotiating table will need to be made a first priority. The current negotiations are potentially blocked because western negotiators are insisting on a rolling back of the nuclear programme as a precondition. This is only likely to happen once some security measures have been put in place. In the immediate term it could involve confidence-building-measures that address reciprocal security anxieties. We do business with our friends and not with our enemies. One of the reasons it is so difficult to resolve conflict is that we seldom look at our own behaviour and how it is perceived by those we see as our enemies. Reports in the media seldom go into the detail of what each side is doing to the other. US-led war games may look like a defensive manoeuver to us, but from North Korea‘s perspective they do not look the same. Conflict is seldom resolved looking through a one-way lens: without getting into the mind of the enemy, real progress is unlikely to be achieved.